Four Season Resort Troon North Scottsdale This hotel is found near the foothills of the area known as Pinnacle Peak. The Four Seasons Resort Troon North Scottsdale has a southwestern style sensibility with its sunny decoration and its casitas. The hotel is nearby the Sonoran Desert as well as the Troon North Golf Course. The Four Seasons Resort Troon North Scottsdale is near public transportation. There is an on-site restaurant at this location. Children can be entertained at the kid’s club while adults can take advantage of the health club. Hilton Resort & Villas Scottsdale This hotel is found in the heart of the city, but in a tranquil part of Scottsdale. 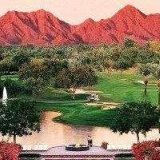 The Hilton Resort & Villas Scottsdale, like other Scottsdale hotels, is situated near the famous Camelback Mountain, and so there is a lot of scenic viewing to be done. The site is within walking distance to many restaurants and shopping centers. Nearby attractions include the Scottsdale Nature Area and the Scottsdale Historical Museum. Hyatt Regency Resort Scottsdale This hotel in Scottsdale is surrounded by pleasant natural amenities, and is against the backdrop of the McDowell Mountains. The Hyatt Regency Resort Scottsdale is nearby the Grand Canyon Air Tours and the Sandolo Boat Rides. Amenities at the Hyatt Regency Resort Scottsdale are contemporary. Guests can look forward to meeting rooms and spa services. There is also a sun bed and a swimming pool for fun. All in all, there are 560 acres for rent. Right outside the lobby there is two and a half acres reserved for a water playground. Intercontinental Montelucia Resort Scottsdale This hotel, like other hotels in Scottsdale, is called the Intercontinental Montelucia Resort Scottsdale. It is found at the foot of Camelback Mountain, which is a short distance the city center. 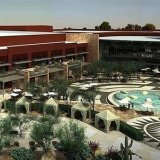 It is nearby landmarks like the Scottsdale Fashion Square. Millennium Resort McCormick Ranch Scottsdale This hotel, known as the Millennium Resort McCormick Ranch Scottsdale, is a lakeside resort that overlooks the scenic landmarks of the Mummy Mountains and Camelback Mountains. Old Town Scottsdale is less than two miles away. Amenities at the Millennium Resort McCormick Ranch Scottsdale include facilities for tennis, golf and sailing. The front desk can also help to arrange horseback riding, jeep tours and cookouts. Orange Tree Golf Resort Scottsdale This location is found in the central part of Scottsdale, but inside a residential community. The Orange Tree Golf Resort Scottsdale, like other hotels in Scottsdale, is near top attractions such as Old Town Scottsdale and the Phoenix Art Museum. Radisson Fort McDowell Resort Scottsdale The hotel known as the Radisson Fort McDowell Resort Scottsdale is centrally located in the Fountain Hills area. It is nearby popular Scottsdale attractions.For recreation there is a gym and massage center. There is an exterior pool for fun outdoors. The hotel also offers a casino and a championship-level golf course. There are two whirlpools at this hotel. The Ahnala Mesquite Room serves Native American-style cuisine. This is a four-star hotel. Scottsdale Cottonwoods Resort This hotel is near the city center and is found close by popular art galleries, museums and golf courses. The Scottsdale Cottonwoods Resort is on twenty-five acres of landscaping. Nearby tourist spots include the Phoenix Zoo, the Borgata Shopping Village and the Desert Botanical Gardens. Scottsdale Resort This hotel, known as the Scottsdale Resort, is surrounded by golf courses, basketball courts and beautiful landscaped areas. The hotel offers scenic views of the fairways and gardens. The Scottsdale Resort offers breakfast, lunch and dinner. Amenities here include Sangria’s Bar and Billiards as well as a ballroom for special occasions. There are a few on-site restaurants and a spa center for relaxation called the Amansala Spa & Salon. Scottsdale Resort and Athletic Club This hotel is found right in the heart of the Scottsdale area. The Scottsdale Resort and Athletic Club is nearby mountains and other scenic locations. It is on the 11th fairway of the Silverado Golf Club.This resort and hotel was actually voted as one of the “Top 50 Tennis Resorts” by Tennis Magazine. 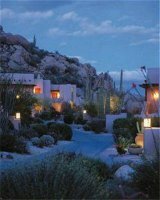 Smoke Tree Resort and Bungalows Scottsdale The Smoke Tree Resort and Bungalows is a true desert oasis. Five lush acres are home to 26 recently remodeled bungalows and suites. These individual private retreats offer luxury accommodations with all the modern amenities. Our expert staff arranges everything from golf and tennis to hiking or massage. Sunterra Links Resort Scottsdale This location is found right in between the TPC Desert Golf Course and McDowell Mountain, the well known tourist attraction. Like other hotels in Scottsdale, the Sunterra Links Resort Scottsdale is just a short drive from the landmark Grand Canyon location. Taking Stick Resort Indian Bend Scottsdale Talking Stick Resort will feature 497 luxurious deluxe guest rooms and suites, a state-of-the-art spa, multiple fine dining and casual restaurants and bars, more than 100,000 square feet of indoor/outdoor function space including a 25,000 square foot ballroom, and 36 holes of championship golf at the adjacent world-renowned Talking Stick Golf Club, managed by Troon Golf. Non-stop excitement and live entertainment will be available at the resort’s 240,000 square foot casino. The Phoenician Hotel Scottsdale This hotel is found in the Valley of the Sun and is known as Phoenician Hotel Scottsdale. It is right next to the Sonoran Desert. There are 647 units to rent at this five-star resort hotel along with 108 casitas, which have private balconies with scenic views. Guests at Phoenician Hotel Scottsdale can look forward to crown moldings and finely crafted furniture. Westin Kierland Resort & Spa Scottsdale This hotel is found in the historic Scottsdale area. The Westin Kierland Resort & Spa Scottsdale is just a quick walk away from notable attractions like the Kierland Shopping Center. Well known Arizona attractions like the Cactus Park and Chase Field are a short drive away. Xona Resort Suites Scottsdale This hotel is found in the heart of the northern Scottsdale area. The Xona Resort Suites Scottsdale is just minutes away from top golf courses, nightclubs and shopping centers. Nearby landmarks and attractions include the Scottsdale Airpark and WestWorld. Amara Resort & Spa Sedona The Amara Resort & Spa Sedona is located near the banks of Oak Creek. 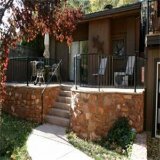 Uptown Sedona is situated only a block away from this Sedona accommodation. Travelers will find many attractions nearby as well as air balloon rides and Jeep tours. Cedars Resort Sedona The Cedars Resort Sedona is well located for travelers. The hotel offers easy access to fishing, swimming, and hiking. Oak Creek is located just outside, and the hotel offers excellent red rock views. Guests of the Cedars Resort Sedona will find numerous shopping and dining options throughout Sedona. Enchantment Resort Sedona The Enchantment Resort Sedona is situated in the remarkably Boynton Canyon. The 70 acre resort is surrounded by red rock formations, making it one of the more scenic hotels in Sedona. The hotel offers easy access to Uptown Sedona as well as the Grand Canyon. The guests of the Enchantment Resort Sedona will find themselves with access to many shops and restaurants. Hilton Resort Sedona The Hilton Resort Sedona is located within easy reach of many of the area’s biggest attractions. There are multiple state parks within easy reach of this hotel in Sedona. Guests will also find museums, galleries, ruins, and monuments throughout the area. The Hilton Resort Sedona offers travelers easy access to attractions via free buses. Junipine Resort Sedona The Junipine Resort Sedona is located in the heart of Oak Creek Canyon. The hotel offers easy access to all of Red Rock Country, including the many canyons and creeks. 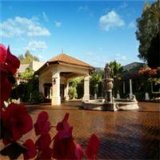 This hotel in Sedona also offers easy access to museums and monuments as well as such attractions as the Chapel of the Holy Cross. Red Rock State Park is eight miles away. L'Auberge de Sedona Resort The L'Auberge de Sedona Resort is situated less than a quarter mile from Uptown Sedona. Guests will find the Tlaquepaque Arts and Crafts Village quite nearby. The Jordan Historical Park is only a mile away from the hotel. The L'Auberge de Sedona Resort is located along the city’s free public transit lines. Los Abrigados Resort and Spa Sedona The Los Abrigados Resort and Spa Sedona sits among twenty two acres of landscaped grounds. The hotel offers easy access to all that the area has to offer, including canyons and Red Rocks. This hotel in Sedona is well placed for a romantic getaway or a family vacation. Oak Tree Terrace Resort Sedona The Oak Creek Terrace Resort Sedona is located in Oak Creek Canyon. The hotel offers easy access to Indian ruins as well as a number of monuments and museums. The hotel is also well placed for day trips to the Grand Canyon, Phoenix, or Flagstaff. The Oak Creek Terrace Resort Sedona is located 130 miles from the Phoenix airport. Each of the guestrooms at the Oak Creek Terrace Resort Sedona is well designed and offers a kitchenette and a patio. Pines Resort Sedona The Pines Resort Sedona is located among the Red Rocks. The hotel offers easy access to such attractions as Native American museums and multiple canyons. Guests will also find that the area offers tours by helicopter, Jeep, hot air balloon, and more. The guests of the Pines Resort Sedona will find ample dining and shopping throughout the area. Hilton El Conquistador Resort Tucson The Hilton El Conquistador Resort Tucson is located at the base of the Santa Catalina Mountains. It is 13 miles from the hotel into the heart of downtown Tucson. The Hilton El Conquistador Resort Tucson is approximately 20 minutes from the Tucson airport. Loews Ventana Canyon Resort Tucson This accommodation in Tuscon separates itself on a private 100 acre stretch of Sonoran desert. The Loews Ventana Canyon Resort Tucson is 1 mile from the Sabino Canyon recreational facility. It is a 20 – 30 minute drive from the hotel to the University of Arizona and the downtown arts district. Miraval Resort Tucson Miraval is an all inclusive, luxury destination resort and spa nestled in the foothills of the Santa Catalina Mountains, on 317 acres of breathtaking high desert, softened by towering palms, wildflowers and cascading streams. Miraval has been recognized as the #1 Spa in the Zagat survey and by the readers of Travel and Leisure for three years in a row. Omni National Resort Tucson The Omni National Resort Tucson is located at the foothills of the Santa Catalina Mountains. The Omni National Resort Tucson is an upscale resort with extensive leisure facilities, named as one of the top 100 resorts in the US by Conde Naste. Starr Pass Resort Tucson Situated at the foot of the Catalina Mountains, the Starr Pass Golf Suites Tucson is within walking distance of the city. The guestrooms at the Starr Pass Golf Suites Tucson are designed to resemble contemporary condominiums, offering full kitchens and private bathrooms. Tanque Verde Ranch Resort Tucson Nestled in the foothills of the Rincon Mountains on 60,000 acres, Tanque Verde Ranch Resort truly offers something for everyone. Want a family vacation to remember? For the past two years, Tanque Verde was nominated as a Top Ten Family Vacation by the Travel Channel. Westin La Paloma Resort Tucson This Tucson accommodation is located 11 miles from downtown Tucson. The Westin La Paloma Resort Tucson is near the retail developments that surround the Tucson airport and the foothills of the Santa Catalina Mountains. The Westin La Paloma Resort Tucson is resort style property with extensive leisure facilities.